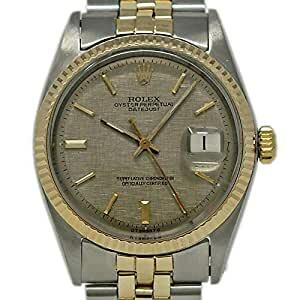 ROLEX DATEJUST, REFERENCE NUMBER: 1603, CASE SIZE/MATERIAL: 36MM STAINLESS STEEL, DIAL: SILVER LINEN WITH INDEX HOUR MARKERS, MOVEMENT: AUTOMATIC, BRACELET MATERIAL: STAINLESS STEEL & 18K YELLOW GOLD JUBILEE, CRYSTAL: PLASTIC, SERIAL: 3 MILLIONS, CIRCA: 1970. THIS WATCH DOES NOT INCLUDE ORIGINAL BOX OR PAPERS. WE WILL PROVIDE YOU WITH AN INVOICE FROM OUR STORE, ALSO A 2 YEARS WARRANTY ON ALL LABOR, AN APPRAISAL FOR INSURANCE PURPOSES.. BUY WITH CONFIDENCE KNOWING EACH TIMEPIECE GOES THROUGH THE SAME RIGOROUS 31-POINT INSPECTION. REST ASSURED ONLY AUTHENTIC PARTS STRAIGHT FROM THE MANUFACTURER ARE USED. THE CERTIFIED PRE-OWNED PROGRAM ON AMAZON ENSURES PEACE OF MIND AND TRANSPARENCY VIA STANDARDIZED REPORTS AND A 1 YEAR WARRANTY PROVIDED BY WATCHFACTS.